Really impressed! Each day they were changing our towels and the bedlines... We were given a nice apartment which could accommodate up to 4 people. Easy check in even if it was late and easy check out! Not to mention that is was also very close to the city center. Recommended! Spacious apartment with a living room and a bedroom. Small but functional kitchenette and adequate bathroom. Good location. Very good price performance ratio if you don't plan to stay in the hotel. It’s out second stay in this proprety and we were not disapointed ! Good location and spacious rooms. Staff was very courteous and respectful, who were always willing to respond positively to my requests. The apartment is perfect for students visiting Vienna: quiet, private, and close to the University and other major city attractions. I'll definitely consider using this property when I return in a few months. The only positive thing about this property is the location and the one night staff guy who helped us... everything else is below subpar... I would give it a negative 10 if that were possible!! The Levante Laudon Aparthotel This rating is a reflection of how the property compares to the industry standard when it comes to price, facilities and services available. It's based on a self-evaluation by the property. Use this rating to help choose your stay! One of our best sellers in Vienna! Just steps from the Burg Theatre and the Rathaus Underground (subway) station, the Levante Laudon occupies a building from the Biedermeier period with a picturesque interior courtyard. Free Wi-Fi is available. The apartments have a bedroom, a separate living room with a sofa bed, and a kitchen or kitchenette with all necessary cutlery and dishes. Bed linens and towels are provided. A washing machine and a dryer are available free of charge. Sights such as St. Stephen’s Cathedral, the Albertina Museum and the Hofburg Imperial Palace can be easily reached by foot. 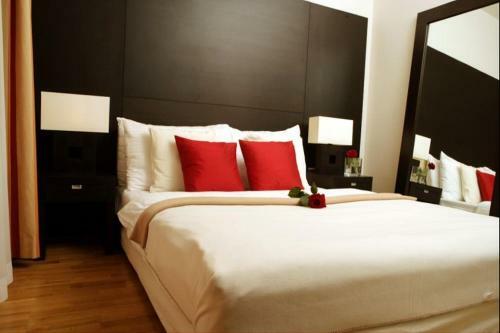 뀐 Located in the real heart of Vienna, this property has an excellent location score of 8.3! When would you like to stay at The Levante Laudon Aparthotel? These light-flooded apartments feature design furniture, a flat-screen TV, a bedroom, a living room with a sitting area, a kitchen, and a bathroom with a bathtub. The apartments are cleaned every 4 days. Please note that extra beds are not possible in this apartment. Private parking is available at a location nearby (reservation is not needed) and costs EUR 25 per day. This apartment has a flat-screen TV, a kitchen, washing machine, sitting area and bathroom. Please note that extra beds are not possible in this apartment. This apartment has a kitchen, a bathroom with a bathtub, shower and toilet, and 2 bedrooms. Area Info – This neighborhood is a great choice for travelers interested in monuments, museums and culture – Check location Great location - show map Guests loved walking around the neighborhood! House Rules The Levante Laudon Aparthotel takes special requests – add in the next step! The Levante Laudon Aparthotel accepts these cards and reserves the right to temporarily hold an amount prior to arrival. The reception is staffed daily between 07:00 and 18:00. After 18:00 guests can ring a bell to be connected to an agent by phone to recieve a PIN code for the key deposit box in case they have informed the hotel of their late arrival, otherwise they may do check in personally at the hotel The Levante Parliament (Auerspergstrasse 9, 1080 Vienna). Contact details to notify the hotel of late arrival can be found in the booking confirmation. Please note that the hotel is not wheelchair-accessible. Please note that a security deposit will be blocked on the credit card on the day of arrival. This deposit will be refunded after departure. Please note that when booking more than 4 units, guests can cancel free of charge until 14 days before arrival. The guest will be charged for the full stay if they cancel in the 14 days before arrival. Please inform The Levante Laudon Aparthotel of your expected arrival time in advance. You can use the Special Requests box when booking, or contact the property directly using the contact details in your confirmation. I would love that I have the chance to stay more days! The place is beautiful, clean, well located, the staff is well educated and is very friendly... When in Vienna this must be the place to stay.... I shall return! The location is pretty good just 15 mins by tram or the subway to the main sightseeings. The staff is quiet friendly & helpful, they made us having a pleasant accommodation. The rooms are clean & comfortable. Highly recommended. We arrived late and although we asked for a late check in we waited half an hour or more for someone to come and open the door for us. The appartment is very clean and has a lot of space and light. Crew is there but can't do anything for you. Receptionis is a really kind person with a good knowledge of local restaurants and great recommendations. I have never received a refund of my security deposit, even though I have contacted the accommodation several times.